After three weeks of family vacation and two weeks of teacher-training seminars, I was eager to spend some time in the mountains. 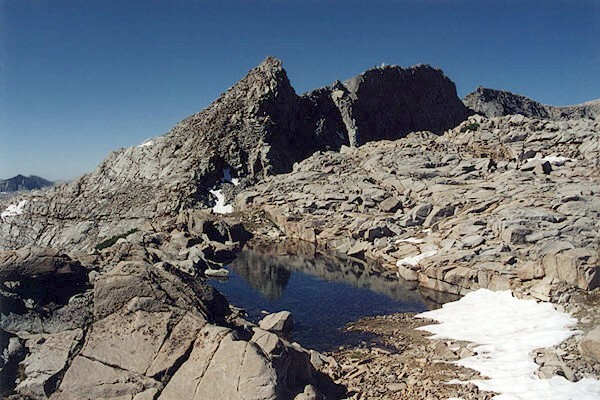 I chose one of my favorite areas, the LeConte Divide. After picking up a permit at the Forest Service Office in Prather, I proceeded to Courtright Reservoir and the Maxson Trailhead. Clouds were building as I hiked toward the day's destination, Rae Lake. The trip into the Red Mountain Basin was uneventful and I was fortunate to avoid showers that were falling all around me. It was my first visit to Rae Lake, a truly beautiful, if heavily used lake. 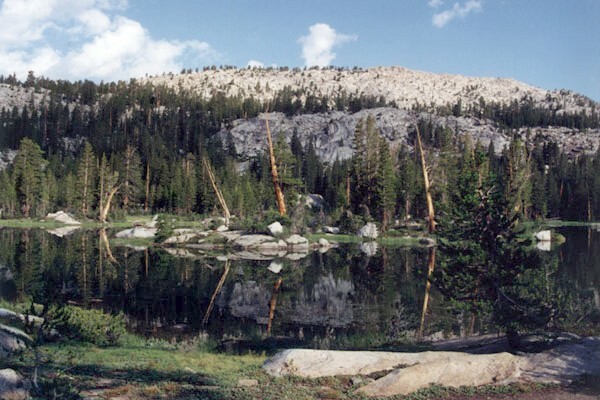 Although it does not provide much solitude, Rae Lake is a lovely destination. 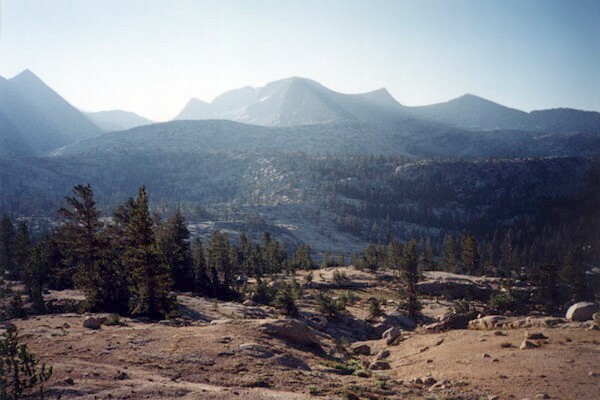 I camped on the south shore with a beautiful view of the LeConte Divide to the east. A couple of parties camped on the north shore were fishing when I arrived. Later that evening singing (and howling) came from the camps on the north shore. I enjoyed a small fire myself. Rain fell a couple of times during the night and I was happy that I had carried a tent. By the time the sun came up and dried the tent, I had finished breakfast and packed all the rest of my gear. Light rain fell off and on as I passed through the Red Mountain Basin toward Devil's Punchbowl. As I climbed up from Devil's Punchbowl toward Two Passes (see day 2 map), the rain became more intense and I had to take shelter on the lee side of pine clumps. Big Shot Lake was beautiful, even in the rain. Bigshot Lake - Rain and hail fell off and on during the second day. I took shelter in the lee side of pine groves when rain threatened to soak me. This lovely view was from one of my shelters. After a short break at the top of the first pass, I moved toward the second and noticed a hiker contouring around the mountain to the west. It was Bill from Tulare and we shared the path to Crabtree Lake where he decided to stay. I wanted to move up to the small lake basin above, but it took about two hours to move from Crabtree Lake to Holster Lake because of rain and hail. Again, I crouched under or next to pine clumps to keep from getting soaked. 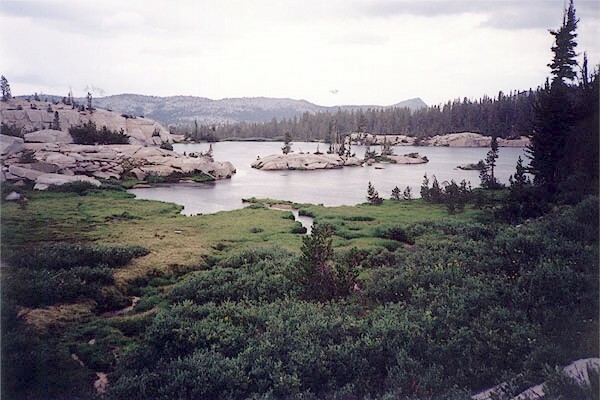 Once at Holster Lake, I set up my tent immediately so I could get out of the rain. As soon as the tent was up, the rain stopped. I decided it would be a good time to have dinner. Then I walked upstream from Bullet Lake and checked out the route (see day 3 map) to Gunsight Pass, the next day's destination. 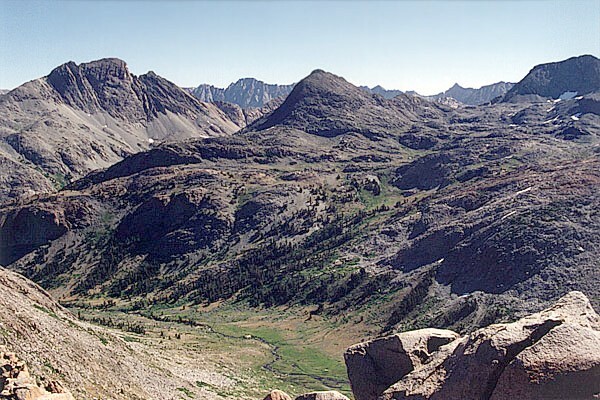 Gunsight Pass - It looked like the south side (right side in photo) of the pass would be easier because it's lower. I hiked to the north side anyway just to see what it looked like on the other side. That evening the mountains above Holster Lake were in and out of cloud shadows. The evening was capped by a dramatic sunset. Holster Lake - As the storm began to break up, the mountains northeast of Holster Lake were in and out of cloud shadows and backed by benign white clouds. Cloudless skies greeted me as I poked my head out of the tent on the morning of the third day, so I got on the trail early. The route to Gunsight Pass was straightforward and I arrived at its northern end at midmorning. Views from the pass were crystal clear. The route into Goddard Canyon was much steeper from this point than from the south end of the pass. 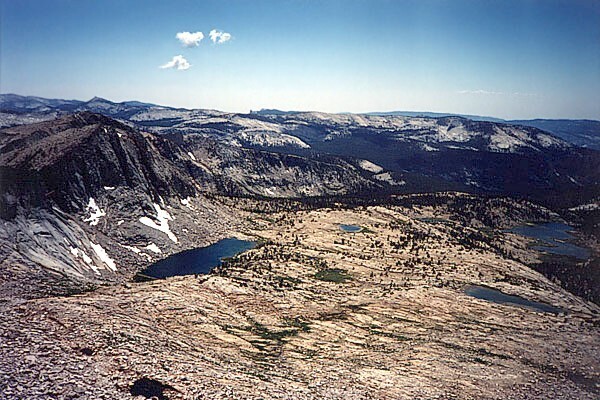 In the photo below, Goddard Canyon is the green-floored valley below, the dark mountains in the middleground are next to Davis and McGee Lakes and the ridge in the backgroud is the Evolution Group of peaks. This is another photo from the north end of Gunsight Pass. Massive Mount Goddard Dominates the skyline while Martha Lake sits serenely to its west. Confusion Lake sits directly on the LeConte Divide. Actually, since it drains into Goddard Canyon, it is obviously to the east of the divide. However, it looks like it should drain to the west. 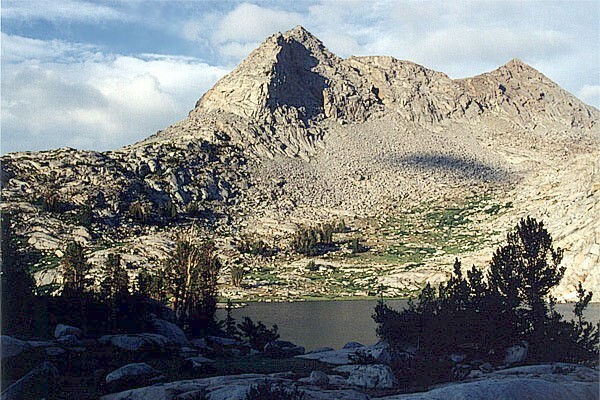 Finger Peak is the lighter gray peak in the right-center background. Next, I moved toward the southern end of Gunsight Pass since the route to Confusion Lake/Pass looked easy from there. On the way, I passed a lovely tarn. 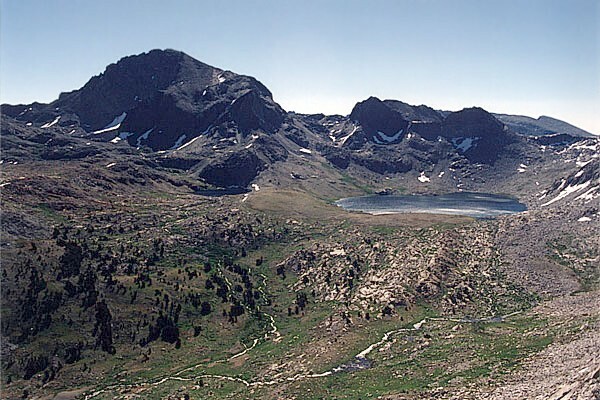 After spending less than an hour on the east side of the divide, I left Kings Canyon National Park and returned to the John Muir Wilderness via Confusion Pass. After a short break at Confusion Lake, I contoured around its northern shore and worked my way toward Little Jo Lake. The crossing looked a little steeper than those I usually take, but I decided to give it a try anyway. 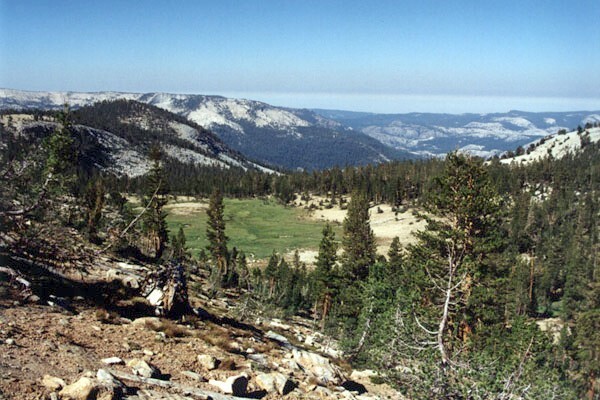 Once on top, I discovered that it was only a short distance to the high point of the ridge. 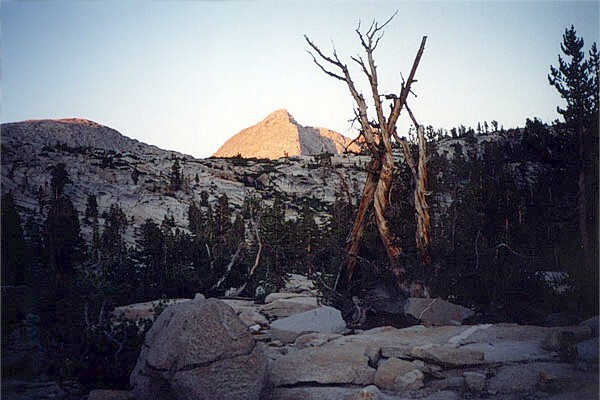 A couple of cairns were perched on a large boulder near the center of the flat topped mountain and one of them contained a 35mm metal film canister with a small register in it. The register had maybe a dozen entries and was placed in 1977 by Frank Yates, Bill Schuler, Mike Lerner, Andy Smatko and Barbara Lilley who had dubbed the spot Mesa Mountain. After reading all the entries, I headed westward to the low point on the ridge and slowly picked my way down toward Little Jo Lake and several other lakes of Bench Valley which were visible from Mesa Mountain. 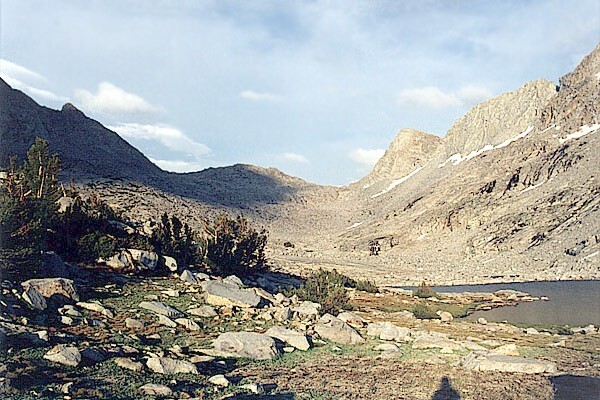 Horsehead Lake is in the far right rear. 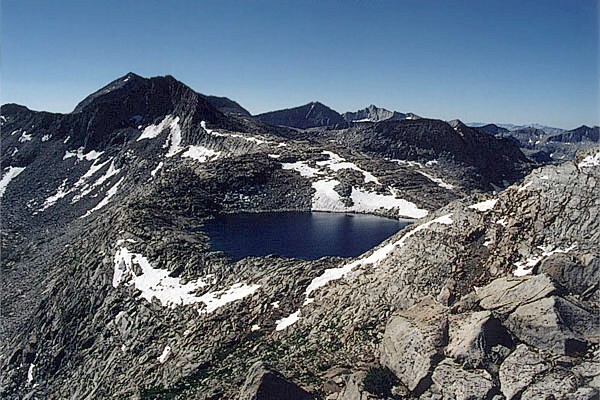 Once past Little Jo, I walked down its outlet stream, past Colt and Horsehead Lakes, and then I ascended into the small valley containing Roman Four Lakes. The path became steeper as I climbed the valley leading to Twin Buck Lakes. Lounging on the shore of the western Twin Buck Lake and enjoying the lovely scenery was a family of four. They mentioned that the path had been busy that afternoon. Two other parties had passed by their camp during the previous hour. A few minutes later, Crabtree Lake came into view and shortly after that I was setting up camp on the large peninsula that juts into the lake. The LeConte Divide shaded Crabtree Lake from the early morning sun but I managed to get up early anyway. I chose a route (see day 4 map) that would take me more or less directly west from the lake. I passed an interesting quartz outcrop where I spent an hour examining milky quartz and other crystals. Then it was up to the low point of the ridge to the west where there was a great view of Mesa Mountain and upper Bench Valley. Next, I headed for the east fork of Meadow Brook and followed it to the trail (next to the west fork of Meadow Brook) that connects the North Fork of the Kings directly with Devil's Punchbowl. The descent to the Kings was pleasant and shady. A few minutes after reaching the Blackcap Basin Trail, the Meadow Brook Cabin came into view. 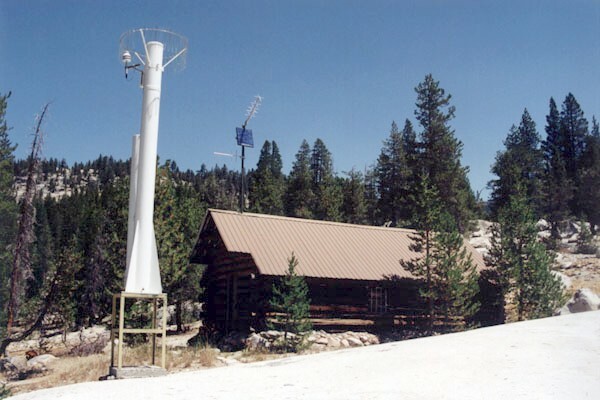 Meadow Brook Cabin is a part of the snow survey system for the North Fork of the Kings River which is used extensively for hydroelectric power generation. The space-age structure on the left is a state of the art, solar powered precipitation monitor. At the place where the North Fork heads west, I stopped for a quick bath. The water was cold but not paralyzing. At Post Corral Creek crossing, I saw a party with llamas leaving toward Long Meadow and decided to give them some space. 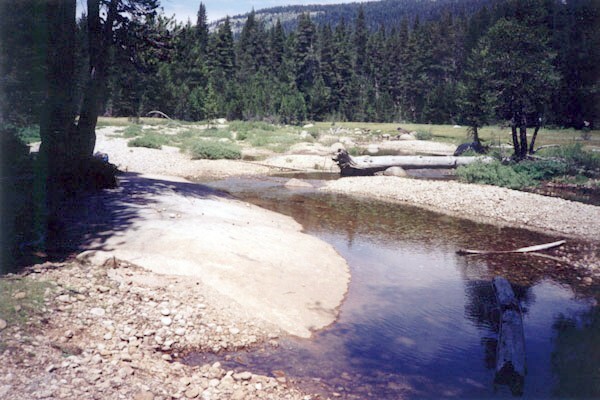 This lovely creek with its nearby meadow make this a popular camping spot. It's one of my favorite rest stops on my way in and out of the North Fork country. After soaking my feet in Post Corral Creek, a very refreshing break, I headed toward Long Meadow. Forty minutes later, I met the same party with llamas returning to Post Corral Creek. I was so surprised that I didn't ask them why they were returning. I watched llama tracks in the trail for another few minutes until I found the place where they had turned around. I looked around for signs of why they might have come that far but could find none. I guess they were just temporarily lost. Three old-timers were lounging at Long Meadow and enjoying the spectacular view to the east. We swapped a few lies then I headed up to the Hobler Lake turnoff. After a short break I began the last leg of that day's hike. Shortly after beginning the descent, I noticed a twin engine airplane buzzing around above. I don't know what he was looking for but he spent the next twenty minutes flying in circles overhead. Before long I could hear engine noises on the four wheel drive trail a few miles away. Once on the four wheel drive trail, I saw one truck disappearing around the corner toward the Maxson Trailhead. I had mixed feelings about bumming a ride to the trailhead, but that was the last truck I saw. Before I knew it the parking lot came into view and as I got closer I realized I had gone beyond my car. Not only that, but as I climbed up the hill to the pavement, I heard voices and saw open car doors and realized I would be interupting some sort of party. I stepped onto the pavement into the middle of a feast. Before I could offer my apologies for the intrusion, a plate and fork had been thrust into my hands and I was invited to fill it with barbeque and all the trimmings. 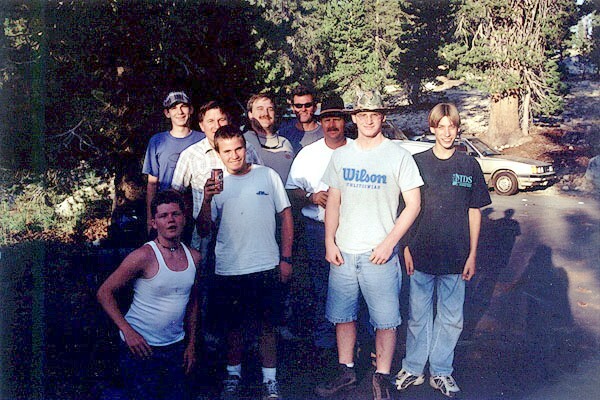 It was Boy Scout Troop 375 from San Diego doing one more good deed for the day before departing on a ten day trip to the Blackcap Basin. Troop 375 of San Diego - One of the leaders of the troop owns a barbeque restaurant and he sent a grand meal with the them to enjoy on the evening before their trip began. It was one of the most pleasant endings to a trip I have ever experienced.